All the hype regarding the GoPro action camera series is well deserved, but I’m not sure about the price being well deserved. As of the writing of this article, I see the GoPro HERO4 Silver selling for almost $400. That is a huge sum of money to pay for a small action camera. A lot of people may be unaware that Polaroid has a pretty robust line of action cameras. While the specs are somewhat less than the latest and greatest GoPro HERO4 Silver, the Polaroid XS100 comes close and in some cases surpass some of the prior generations as well as the competition. The latest Polaroid XS100 weighs in at less than five ounces and is a little more than four inches long. The camera features stabilization software built in and the video produced in high vibration environments looks good. Polaroid even offers a wi-fi version for about $60 more than the base. Unlike the GoPro cameras, the Polaroid XS100 does not require any weatherproof case around it as the camera is advertised by Polaroid as being waterproof to 30 feet without any protective case. The bottom of the Polaroid XS100 and XS80 feature a 1/4″ 20 threaded screw hole. This is the screw pattern common to a tripod. This means that after market mounts for the Polaroid XS100 and XS80 Action Cameras are plentiful. Make an assessment of where you want to mount your camera. Also assess if the environment will be a high vibration one. If you are planning to mount it on Waverunner, ATV or plan to ride a motorcycle off-road, consider use of a mount with metal components. Lower vibration environments can likely use a heavy duty plastic mount, but make sure it’s well made. Polaroid themselves does offer a series of plastic mounts that use a ball and socket design. They seem adequate for low vibration environments but I don’t like them for high vibration environments. Heavy vibration situations where you have a handlebar or a round tube such as a rollbar can benefit from the use of a good quality metal mount from RAM that features a tripod screw. For handlebars up to 1.25″, consider the RAM Camera Mount for Motorcycle Handlebars. 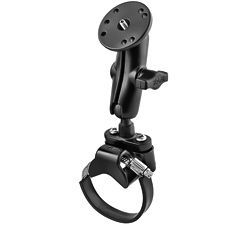 This is a great metal mount which features extra support for your camera and has a lifetime warranty. Larger diameter bars can benefit from the RAM Clamp Mount for Cameras. This is the one in the photo that accompanies the article. Made of metal and offers a lifetime manufacturer warranty. Some applications such as a surf board need a flat surface mount. Polaroid offers a Polaroid Camera Action Mount Board Kit manufactured of metal and plastic that uses adhesive to attach to any flat surface. The key to using this (or any adhesive mount) is to ensure the flat surface is completely clean and free from any chemicals such as wax or oils. Use an alcohol wipe to remove any chemicals, then attach the adhesive mount to the flat surface. be sure to let the mount sit unused in a horizontal position for at least 24 hours before use. This allows the adhesive chemicals to set and provides the best adhesion. Also be sure the adhesive that your mount uses is Very High Bond (VHB). My experience with VHB is very good and when adhered properly to the flat surface, it typically provides a very secure hold.